RELEASE VIDEO FOR "UNTIL THE NEXT TIME"
In the midst of European festivals and headlining shows, Dropkick Murphys have released a video for "Until The Next Time," from their 11 Short Stories Of Pain & Glory album. Check out the video here: https://youtu.be/-O_cOnGrpY8. Dropkick Murphys' Ken Casey explains, "The music video for 'Until The Next Time' was directed by our longtime friend and amazing photographer Gregory Nolan during our 11 Short Stories of Pain & Glory Tour in both Europe and the U.S. This song is about our relationship with YOU, the best fans on the planet. It's about the memories and the great friends we've made along the way…about the pleasure of coming to so many cities that we feel we can almost call home, and the bittersweet moments of having to say goodbye and move on to the next town every night." According to drummer Matt Kelly, "Until The Next Time" is "a song about having to put the good times on hold temporarily. We were glad to come, so sad to go, so while we're here we'll have us a real good time! See you out on the ice!" Gregory Nolan, tour videographer and director of the video said, "There are two kinds of shots I love with the Dropkicks: hijinks between band members and moments of connection between the band and fans. The awesome thing about putting together this music video is that I got to shape the story that puts these relationships at the center, with music as the method of connection. It's the perfect song to celebrate the good times, and to get the sense that the friendships we share will always come back around again." 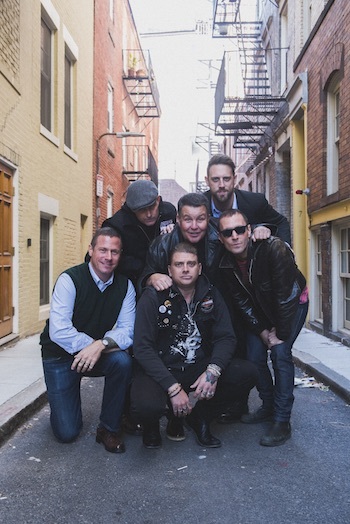 Dropkick Murphys—Al Barr, Tim Brennan, Ken Casey, Jeff DaRosa, Matt Kelly, James Lynch—return to the U.S. in July for their co-headlining From Boston To Berkeley Tour with Rancid. The month-long trek kicks off July 27 in Bangor, ME and wraps August 26 at the It's Not Dead festival in San Bernardino, CA, near Los Angeles. Each night of the tour will culminate with Rancid and Dropkick Murphys on stage together for a joint encore. The Bouncing Souls and Jake Burns open the July 27-August 9 shows and The Selecter and Kevin Seconds open from August 11-26. Tickets are on sale now at www.DropkickMurphys.com. Rancid and Dropkick Murphys have a long and important history together. Back in 1997, Rancid's Lars Frederiksen came across a copy of Dropkick Murphys' original EP at a friend's house. He turned it over to his bandmate and Hellcat Records president Tim Armstrong, who quickly snatched up the band for his new label. Dropkick Murphys are touring in support of their 11 Short Stories Of Pain & Glory album, released through the band's own Born & Bred Records earlier this year. The album debuted at #8 on the Billboard Top 200 and was the #1 independently released album. There's a feeling of purpose throughout the album, influenced by the band's work with The Claddagh Fund, a charity the band established in 2009 to help support addiction recovery as well as children's and veterans' organizations. Dropkick Murphys are hands-on in raising funds, mentoring, and lending a helping hand with veterans, youth sports, and drug and alcohol rehabilitation. Many of the songs reflect these experiences, and the band's sadness, anger and dismay at the opiate epidemic ravaging the country — in particular, Boston and New England — and also their feeling of pride and optimism at the sight of those who have turned their lives around. Dropkick Murphys have become ambassadors for their city. In Boston, it seems like everybody knows someone connected to the band whether by blood, friendship, or the time they shared a brew at a Bruins game. They've built a legacy that does Beantown proud.